You might recall that my last post was a "Lightened Up Summer Supper." You must think I've lost it following up with this Cream Puffs post. Sorry. This was actually a dessert I made at my Mom's house during the feasting, so it's decadence was more appropriate at the time than it's timing here. And let's face it... no one wants to read about a healthy dinner, right? Not two posts in a row, at least. When we were little, my sister and I lived for Potlucks at Church. One Potluck dessert that was particularly coveted was Mrs. Schluetter's* Homemade Cream Puffs. *Her name has been changed for her protection, and because I can't remember it. They were light, free-form puffs, filled with custard and dusted with powdered sugar. And there were only about a dozen of them. An early lesson of supply and demand. Here is my version of these beloved Cream Puffs. 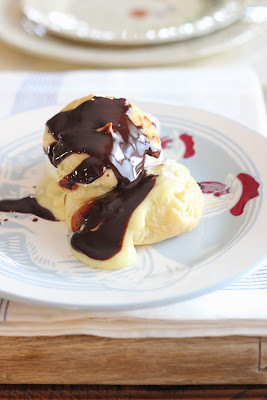 I topped them with Chocolate Sauce, but almost wish I would've dusted them with powdered sugar to have been able to really enjoy the delicate puff and homemade custard. That Mrs. Schluetter knew what she was doing. You can pick your poison. Bring water, butter, sugar, salt and vanilla to a boil. Remove pan from heat and add flour, stirring with wooden spoon until dough separates from sides of pan. Add 1 egg at a time, stirring until dough smooths out. On a silpat lined (or parchment or sprayed) baking sheet, make 12 dollops. Bake for 30 minutes at 375 degrees, then 20 minutes at 300 degrees. Remove from oven and let puffs cool. To make the pastry cream, heat cream, sugar, and salt in a saucepan over medium-high heat until simmering, stirring occasionally to dissolve the sugar. Meanwhile, whisk the egg yolks in a medium bowl and whisk until the mixture is creamy, about 15 seconds. Whisk in the cornstarch until combined and the mixture is pale yellow and thick, about 30 seconds. When the cream mixture has reached a simmer, slowly add it to the egg mixture while whisking constantly. Return the mixture to the saucepan. Return the mixture to a simmer over medium heat, whisking constantly until the mixture has thickened, approx. 30 seconds. Remove from the heat, whisk in the butter and vanilla. Place in a glass bowl and cover with plastic wrap. Chill before filling puffs, unless you'd like to serve them warm... which is fabulous. How can diets start on Monday with posts like this?? We are having a dinner party this Thursday and I think I might try these. Looks delicious. Right when you start adding eggs, I start wishing I had an extra hand to do everything at once! Yummy! I haven't made homemade cream puffs in a loooong time!! Your recipe looks wonderful. I'll be pinning this so I can make them the next time I need to serve something special. What recipe did you use for the chocolate sauce, or was it just a drizzle of Hershey's? Ooh they look absolutely delicious Jenny. Hello There. I found the blog using msn. Is definitely a rather well written post. I will be sure to bookmark it and return and learn more in your useful information. A couple of certainly lots of particulars such as that to consider. one you bring up the place one of the important factor is using in truthful good faith. enjoyment, for the remaining of their lives. may have been selling. And we recognize we need the website owner to thank for that. extraordinarily indispensable. Thanks for everything! under no circumstances appear to get one thing done. Of course, what a magnificent site and illuminating posts, I surely will bookmark your blog. make sure to don’t fail to remember this website and provides it a look regularly. tips. Perhaps you can write next articles referring to this article. I want to read more things about it! excellent know-how to go over with my great friends.